Dubai, UAE, May 14, 2018: Time flies, so the Balmain de Balmain II Mini collection puts its heart and soul into capturing the moments. These Swiss made timepiece is about treasuring the essentials. They draw on an extensive selection of details that make a difference. There are strong sporty statements, right through to elegant expressions of femininity with a playful twist. It’s time to celebrate the multi-faceted lifestyles of twenty-first century women. 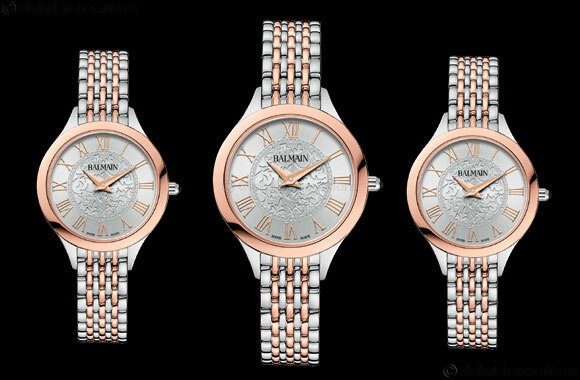 Balmain de Balmain II Mini watch has its own way of adding an accent to the overall language of grace. On some, iconic arabesque patterns adorn a portion of the dial to confirm intrinsic femininity. Sometimes these botanical elements form a perfect circle. At other times they grow into the dial to reflect natural beauty. In contrast there are dreamy mother of pearl dials hosting fine Roman numerals. This is a collection that adds whispers of tradition to a coolly contemporary look. This Balmain watch is priced at AED 1620, and are available at all Rivoli stores across the UAE.